War tourism in the occupied territories can be divided into two principal categories: Simulatory War Tourism, which trains tourists to shoot at Palestinians through war simulation exercises, and Participatory War Tourism, which aims to recruit non-Israeli, often non-Jewish, individuals directly into the IDF, usually for military holidays on a temporary basis but, in some cases, as an avenue for obtaining Israeli citizenship. 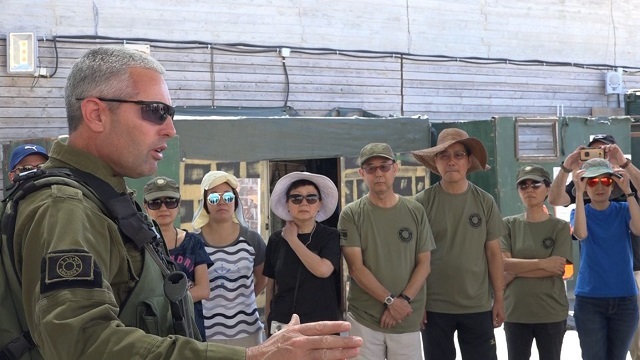 The function of Simulatory War Tourism is to acclimatise tourists to the organised violence of the Israeli occupation, thus enlisting them into its contours of power. There are four main organisations specialising in this field: Caliber 3, Funtum, Zikit Extreme and Cherev Gidon. This organisation operates from a military base in Gush Etzion, a cluster of settlements near Jerusalem. It is an IDF-certified organisation, founded in 2003 by IDF Colonel Sharon Gat with the blessing of the Prime Minister, the Defence Ministry and the Ministry for Homeland Security. They also offer discounts to celebrities, and were seemingly taken up on this by US comedian Jerry Seinfeld and even rock group Aerosmith who, according to a Caliber 3 employee, did not want their visit publicised. Based in Nez Tziona and founded in October 2014 by Ben Carmel, Funtum is estimated to attract between 5,000 to 8,000 tourists a year. The organisation differs from Calibre 3 in its more flexible approach to where it operates, typically arranging trips to a range of different locations. Funtum offer clients the opportunity to take part in ‘concept events.’ The ‘boot camp’ option on their website displays footage of expeditions to the occupied Golan Heights, where ‘terrorist kidnappings’ are staged in which a man dressed in a dishdasha and a kufiyeh takes the tourists hostage. The lone terrorist takes the group into an abandoned building, where he is eventually brought down by IDF soldiers, upon which the group celebrates their ‘liberators’. The group then take part in a make believe enlisting in the IDF, during which they put on new imitation IDF uniforms and begin training in Krav Maga. They are generally given paintball weapons, though in some cases guns with live ammunition are used to shoot at targets. They also carry each other on stretchers, which presumably makes up the boot camp part of the day. A striking aspect of Funtom’s online marketing is the extent to which it is targeted at children. Their YouTube channel features children being led around carrying weapons and shooting at targets. While their ages cannot be discerned from the footage, they are visibly children. This aspect of Funtom allows it to serve as a gateway for children into later IDF recruitment by cultivating and normalising within them violence towards Palestinians. This organisation is led by CEO Elchai Finn who (according to his Instagram account) appears to have taken part in Operation Protective Edge, the 2014 campaign in Gaza that left around 2,300 Palestinians dead. Zikit Extreme claims to offer “the IDF experience” with the training modelled on “the IDF’s counter terrorism course” and, again, featuring people supposed to be Palestinian kidnappers. Zikit seems to be more focused on use of paintball and rubber bullets rather than training with live ammunition. However, they enthusiastically offer a “Boot Camp for Kids” option, including generous offers of “pizza and birthday cake.” The insidious targeting of children is prominent in their promotional videos, emphasising the “fun” in the systematisation of violence by an army of occupation. 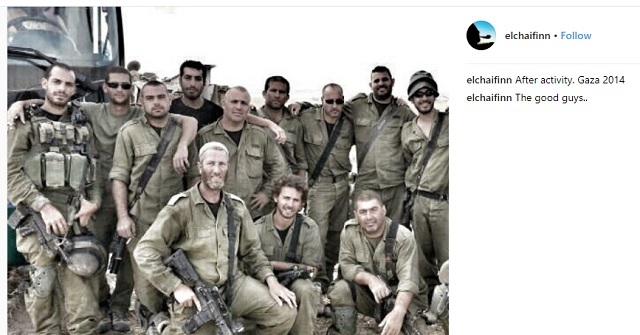 Zikit Extreme CEO Elchai Finn appears to have taken part in Operation Protective Edge, the 2014 campaign in Gaza that left around 2,300 Palestinians dead. Having grown up on an Israeli settlement, and later serving in the IDF, Stern has clearly developed quite the penchant for firearms. He has been based in the US for eleven years, and claims to have “trained hundreds of students.” His students have the option of different courses in the use of rifles, pistols, shotguns and Uzis. At the start of every session, students are dressed in IDF uniforms. A process of militarisation linked to the IDF is thus clearly taking place within the borders of the United States — one that seeks not only to export an IDF culture of violence into the US, but also to export foreign wo/manpower to Israel in service of the occupation. The term ‘lone soldier’ refers to foreign national volunteers who join the IDF from abroad, often returning to their country of citizenship at the end of their military service. These volunteers — who do not benefit from a local family network once in the army — are supported by independent organisations, notably ‘the Lone Soldier Centre’ which claims the IDF comprises up to 7,000 such soldiers. A range of common routes are available for these volunteers through different organisations, each of which encourages a particular form of war tourism. The four best known such organisations are Mahal, Marva, Tzofim Garin Tzabar and Sar-El. Today, the organisation hosts foreign national volunteers who serve in the IDF for periods of between 15 and 18 months. The programme is purposely targeted at non-Israeli citizens between the ages of 18 and 23, and is described by the IDF as “an administrative gate through which non-Israelis enlist” in the military. Marva charges students around $2,000 for an eight-week-long programme in which they are taught about life in the IDF. Students must be aged 18 to 28 and ready for the “mentally demanding programme.” The training includes target practise, using M16s with live ammunition, as well as staying on army bases and undertaking expeditions where students sleep in tents and learn the basics of field techniques (camouflage etc.) It also includes hikes and political lectures. The main training takes place at the Sdeh Boker Gadna Base, in the Southern Negev. Gadna is a programme designed to militarise Israeli school children and Marva students are integrated into this process. The Marva training also extends to trips as far from the base as Jerusalem, the occupied Golan Heights and the Galilee. This programme, which aims to quickly acclimatise young non-Israelis to life in the IDF has a proven track-record as a gateway to joining the army of occupation. This programme is focused on a more holistic all-encompassing approach to enlisting foreign nationals into the IDF. It involves a set of five seminars, held throughout the year in the United States, in preparation for a move to a kibbutz where they will be greeted by a strong network helping them to settle in. This well-known organisation boasts branches across the world, and runs programmes, each lasting a minimum of two weeks, working at IDF bases. It is believed to bring around 4,000 volunteers annually. Between 1983 and 2011, it is claimed the programmes recruited more than a hundred thousand volunteers to the IDF. Sar-El offers the chance volunteers to work in IDF warehouses, cleaning military hardware and also in hospitals. The volunteers stay in army barracks, and work 8 hour days, 5 days a week, all dressed in IDF uniforms. The organisation explicitly targets Christians in its recruitment advertising. There also appears to be large elderly constituency for Sar-El, who seem to relish being put to work painting walls in military barracks. Israel has weaponised the ostensibly benign practice of tourism to normalise the extreme violence of its occupation and, more importantly, for the recruitment into its army of foreign nationals in order to strengthen its grip on the territories it occupies. Its simulatory war tourism converts tourists into ambassadors for the occupation, emulating and replicating Israeli mechanisms of oppression, while the practise of participatory war tourism is a gateway for an IDF volunteer class that often serves in Israeli campaigns before returning to their societies of citizenship, with no accountability for their deeds. In the Israeli-occupied Palestinian territories, tourism functions as a tool to strengthen the occupation. Such voyeuristic war tourism has fostered a sense of celebration of the technologically-sophisticated, organised killing of Palestinians. A fully referenced version of this article is available upon request from Ceasefire. On 30 March 2018, Land day, peaceful Palestinian protestors were fired at with live bullets by Israeli snipers that killed 17 people and injured over 1500. Write to Boris Johnson and urge the Government to take action now, and join us this coming Saturday to call for an end to the siege of Gaza and ask UK government to condemn Israel’s actions.